I have, while we were house hunting. Not only do I remember feeling turned off from bad real estate photography (like countertops piled so high with clutter you could barely see the kitchen, dishes in the sink, and dark, blurry photos that make untidy houses look like unclean hovels) but I also remember visiting a 1970s apartment in Applecross with my parents and Mr Nerd. The inside of the apartment looked okay in the photos. But there was a horrible smell as we walked down the weed-covered path through the dead gardens to the front door. It was a dead magpie, right near the front steps. I have NO idea why the real estate agent (who proceeded to ring me mercilessly every two days for the next three weeks, even after telling him the apartment wasn't what we were looking for) didn't get rid of it for the next home open. And inside the apartment, after we were blinded by the hideous bright yellow walls, we looked down to see a trail of rat droppings and a box of rat poison on the kitchen floor. Not quite what most people envision when they picture themselves romantically finding their dream house. Deceased avians and rat baits have no place in today’s competitive real estate market, when presenting your house at its best is more important as ever. Both home owners and real estate agents frequently need to do what they can to make their properties stand out from the crowd and achieve the highest selling price - and home staging is one of them. 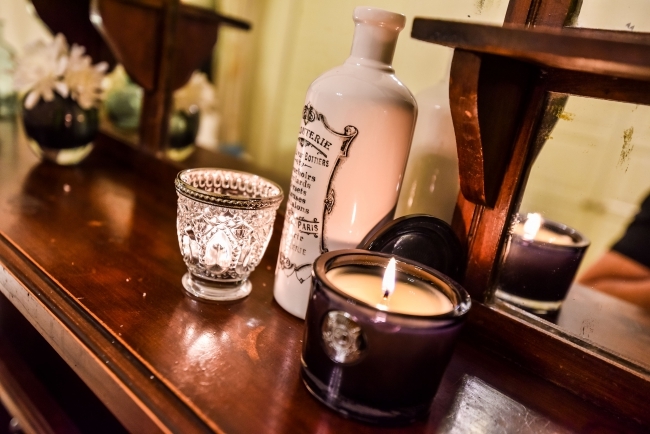 Some of you will be wondering, what on earth is home staging? 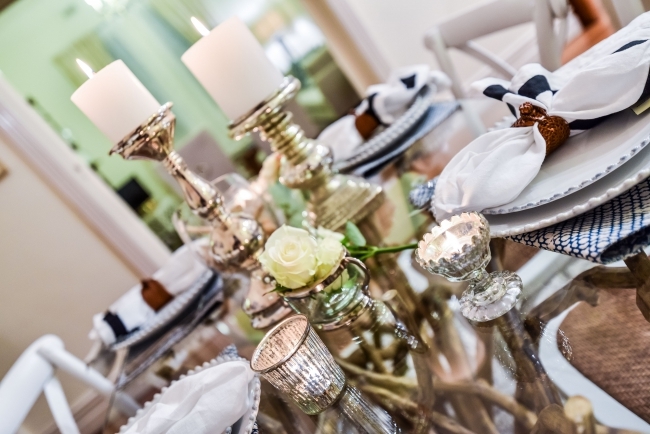 First conceptualised in the United States and now getting more and more widespread in Australia, home staging is the practice of preparing and styling a private home for sale, with the goal being to make the home look and feel more appealing, stand out from a crowd, showcase its versatility and scope to attract the highest number of potential buyers. 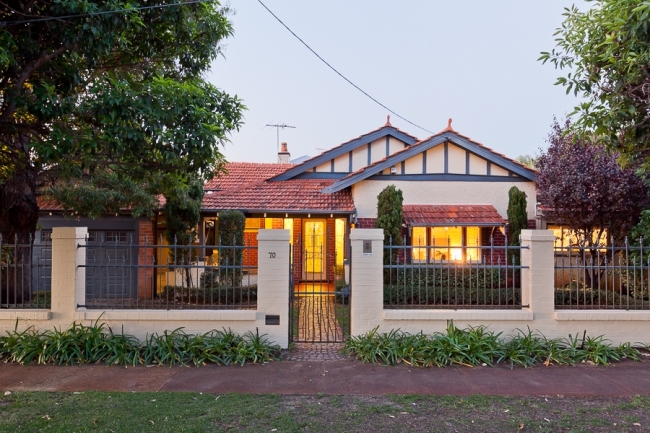 The end goal is to make a property sell more quickly – and sometimes for more. 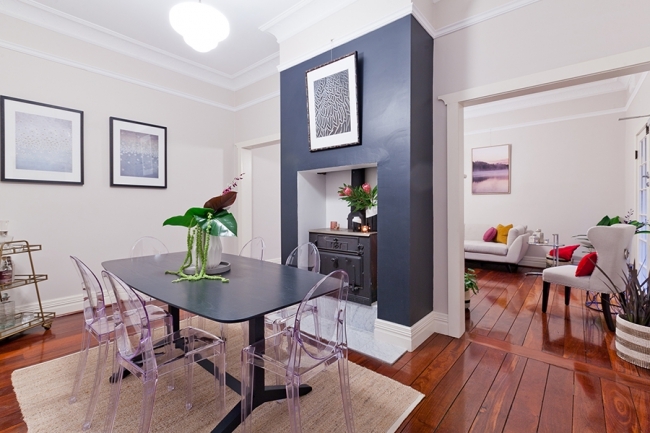 The property styling and staging industry in Australia has gone through a sharp growth in the past couple of years; there are now numerous companies that offer staging services across our city alone, so it’s nothing new. 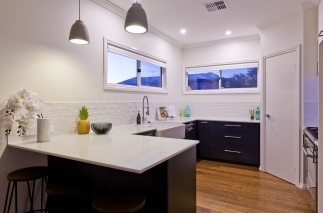 Traditionally, people can engage the services of a property styling business, with a home owner or real estate agent will invest in the service in the hope that it will pay off in a great selling price. But when I heard about The Perth Property Co., I thought, “Now THIS is a great idea”. This is a boutique company that offers real estate listing together with complimentary home staging. The Perth Property Co. licensee director Nadija Begovich is a licensed finance broker who got into real estate six years ago. With a lifelong love of houses and interior design, she quickly realised that in her real estate capabilities she had an ability to look at a client’s home and instantly see where it could be decluttered, fixed up and styled to sell quickly, and at a good price. “I started out years ago by helping my clients add fresh linens to bedrooms and bright cushions and accessories to living areas so their homes were presented a little better,” she says. “I felt there was an opportunity for me to combine my passion for property with my passion for interior design and create a point of difference with the service I offered as a real estate agent." Nadija, who predominantly sells homes around the inner-city suburbs of North Perth/Mount Lawley area but takes on listings across Perth (“We go where we’re needed”) says she saw a niche in the market for a boutique real estate company that also offered home styling and staging (without the additional cost). “I saw an opportunity to differentiate my business model as I had a passion for property as well,” she says. “The two work well together and splitting my skill set across finance and real estate makes for a unique service offering compared to other providers.” She teamed up with husband Dan Broad to launch The Perth Property Co.
“Staging and styling can be very costly and not everyone has the ability to outlay this expense when they’re selling their house. I wanted to help people by making a difference in a small way; when you work with The Perth Property Co this service is complimentary." ABOVE: Real estate agent and finance broker Nadija Begovich and some of her real estate styling. 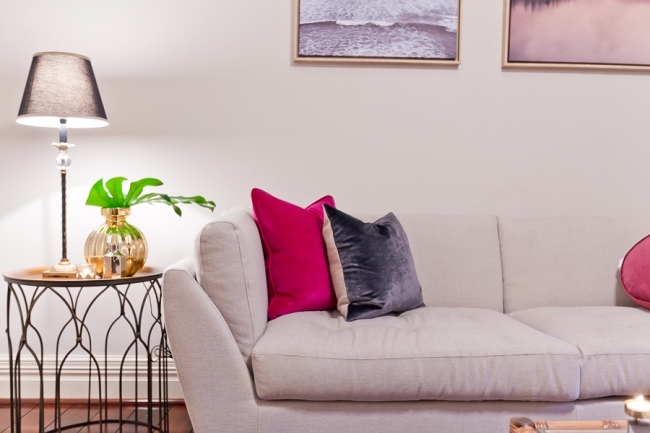 While there are now numerous standalone professional home staging businesses across Perth, where home owners pay for the business’s staging services, Nadija knew there was a hole in the market for a company that combined real estate with complimentary staging. “I’d always wanted to set up my own agency and 2017 presented that opportunity,” she says. 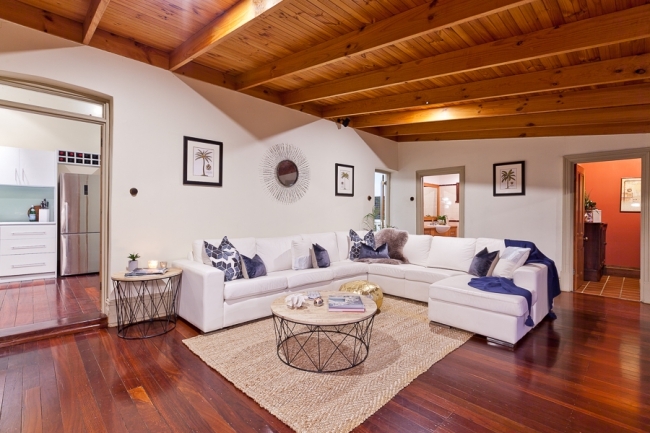 “So Dan and I took the plunge in January and established The Perth Property Co.” Since its inception, they have been able to offer all clients who desire it a free-of-charge styling and staging service for the homes they sell. “Whether vacant or owner-occupied, we’re able to partially style and stage a house or fully dress it from top to bottom,” says Nadija. Have you ever noticed every time a character in a movie is looking at a house to buy, the house is empty and unfurnished? The sparse, empty home thing might work well to win characters over in the movies. But in real life, nicely decorated and staged homes tend to sell faster than empty houses, says Nadija. 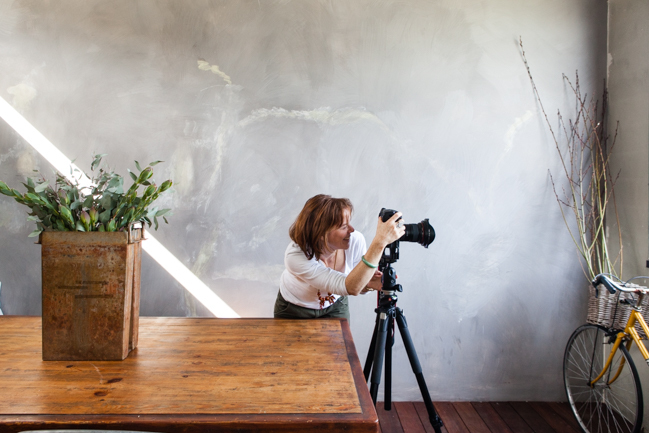 Staging also minimises the chance of potential buyers being turned off – whether that be from merely photographs, or from a property in real life, like I was telling you about earlier. 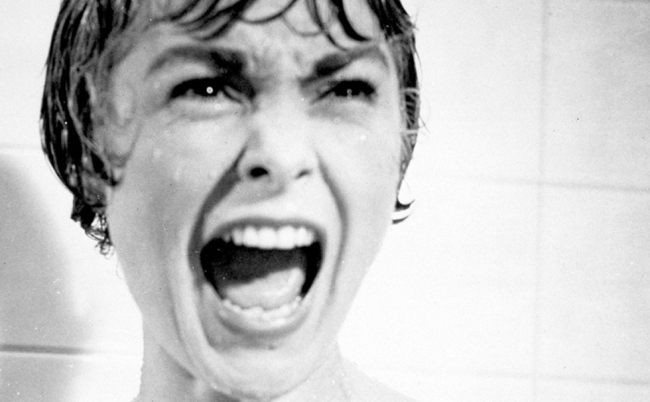 I ask Nadija if she has any real estate horror stories. “Years ago, like six years ago, I was asked to sell a top floor fully furnished apartment in Mt Lawley for a chap who was living in London,” she says. “His tenants had gone overseas for a month on holiday and the property was to be sold as their lease was coming to an end. I’d viewed the property a few weeks earlier with my clients parents and it presented reasonably well. The tenants had given us the okay to come in and take pics of the property whilst they were away so that we could start the marketing campaign. “I arrived 30 minutes before my photographer and was completely horrified. The apartment was left in total disarray, there were clothes thrown everywhere, food was left out on the benchtops, the dishes were piled a mile high in the sink, the bedrooms were a mess. And smack bang and nestled in the centre of the lounge room/kitchen was a home gym, which wasn’t there before. And to top it off the tenants had turned off the fridge/freezer. The stench was horrific! 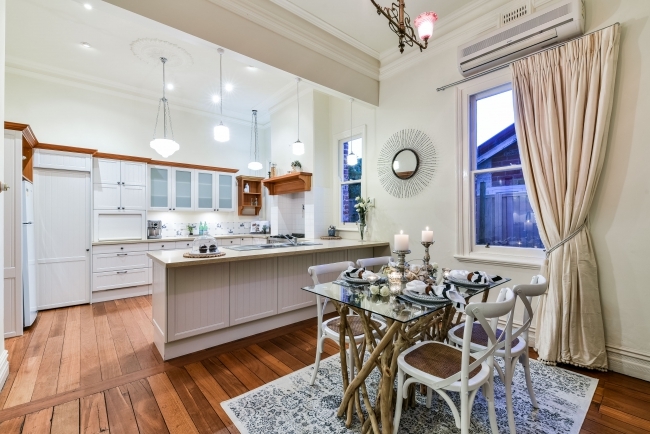 There is a reason that display home builders always open up the homes to the public with the homes furnished and beautifully styled - it makes sense. A furnished home usually looks better, and generally, your average person is better able to visualise themselves living in a house that is furnished rather than one that is empty. So in the event of a home open or viewing, they’re more likely to develop a greater emotional connection to a property, picturing themselves curling up in that comfortable-looking club chair by the fireplace, having a morning coffee on that patio listening to the birds, or lying in bed gazing out at the garden view. NOT the Applecross apartment! 40 Hinkler Loop, Maylands. 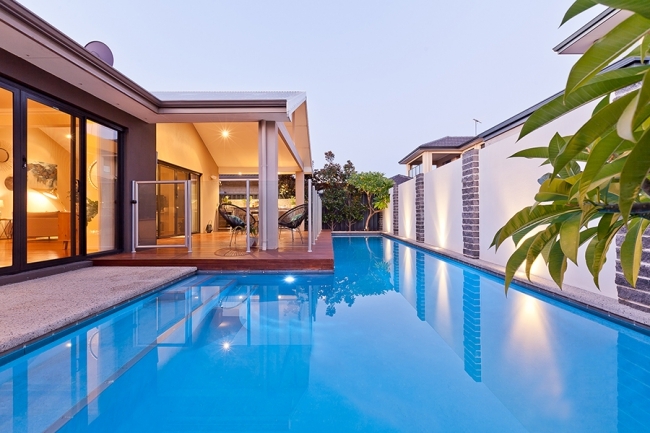 Nadija's listing at 40 Hinkler Loop, Maylands required husband Dan to take a refreshing winter dip. 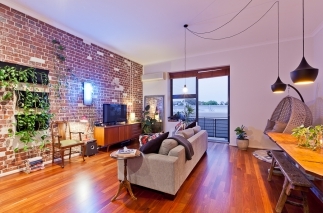 "This house has a lovely pool and great mood lighting," says Nadija. "The day of the photoshoot we realised one of the lights on the back wall was not working and the only way to reach it was through the pool. I made Dan don his bathers (twice) in the middle of winter to wade through the pool find out what type of halogen globe was required and then after acquiring a new globe from Bunnings, get back in and install the globe." A home stylist or stager is also a fresh pair of eyes who will look at your home and suggest ways you can make it more appealing and seem more versatile. For example, a stylist might look at your house’s empty landing and advise putting a study desk or a cosy reading chair and small bookshelf there - turning an empty ‘dead space’ of the property into another functional, aesthetically-pleasing room or corner. Or they might advise you seriously declutter your junk room (c’mon, nearly all of us have one! I know we definitely do!) to decorate it and turn it into a guest bedroom. 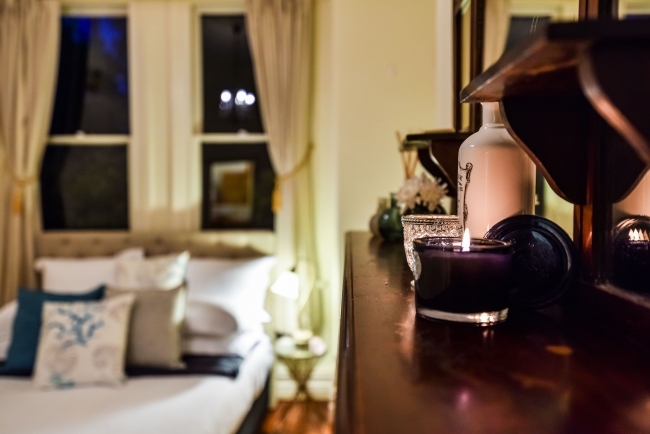 A potential buyer is going to be more attracted to a guest bedroom over a junk room, will be more likely to visualise their own family or friends staying in that inviting guest bedroom - and chances are they will start to want the house more. It’s about showcasing versatility. 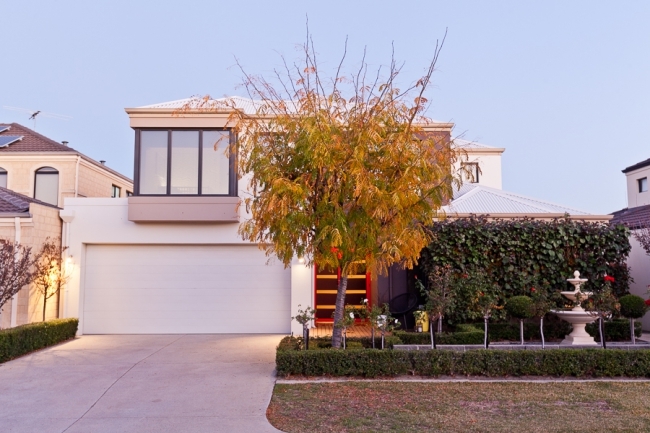 “We sold a large Federation style home in Mt Lawley recently and it was launched as a 3 x 2 with a large billiard room that merged with a lounge area,” says Nadija. “After a few home opens, I was able to encourage the sellers to convert the billiard room into a fourth bedroom which would increase our chances of getting their desired price point. We facilitated a speedy and cost-effective renovation, basically erecting a stud wall in one week and dressed the room as a grand guest bedroom with a beautiful fire place and its own separate entry and not long later the property was sold. So what tend to be the most common presentation mistakes home owners make when they put their property on the market? “Sometimes people rush to put a property online without putting in enough effort or thinking about the buyer and what they want to see,” says Nadija. “We always point out major things like polarizing colours, poor paint jobs or walls with glaring cracks in them to our clients and suggest repair works. But the biggest presentation mistakes are often the simplest things; an undressed bed, too much clutter on a kitchen bench or an untidy bathroom.” I know as a home owner that it’s easy to ‘get used to’ something without realising how off-putting it may be to someone looking to buy a home. 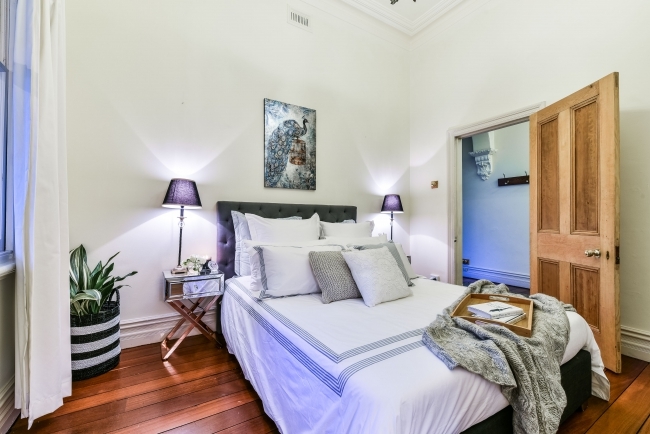 When a home owner wants to list with The Perth Property Co, Nadija says what first happens is a general ‘stocktake’ of the property, looking at what furniture, art and decoration is already there or what should be brought in. “This is basically an assessment that outlines what needs to be actioned in order to prepare the home for sale; then we allocate tasks which either the seller will complete or we will complete,” she says. 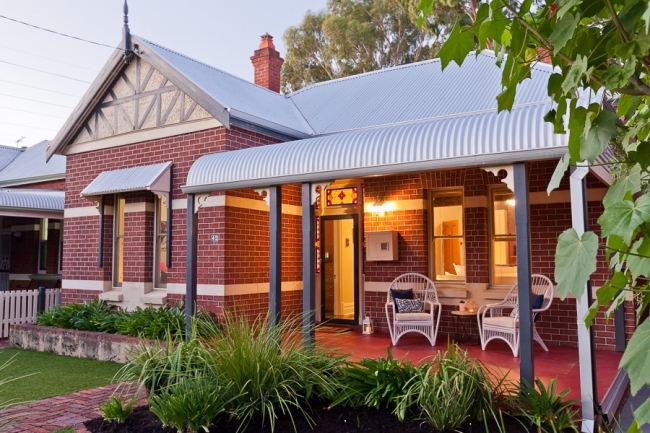 With a recent Maylands property, the seller had moved out so the property was vacant. “We had a blank canvas to work with,” says Nadija. “This is a great opportunity to bring suitable pieces into the home and showcase the features of the property. We brought contemporary furnishings that complimented the modern design aspects and fully staged and styled the property outside and in. On the flip side, when houses are lived-in, we still tend to use the same approach: we’ll give our professional opinion on key elements that we feel will enhance the presentation and marketing of the home (this may include, for example, swapping out dominant items of furniture with pieces that better suit the room and create space or suggesting a quick paint job). All of the accessories and items stay in our clients homes until the properties are sold and we have a network of suppliers we work with which mean last minute improvements can literally happen overnight." 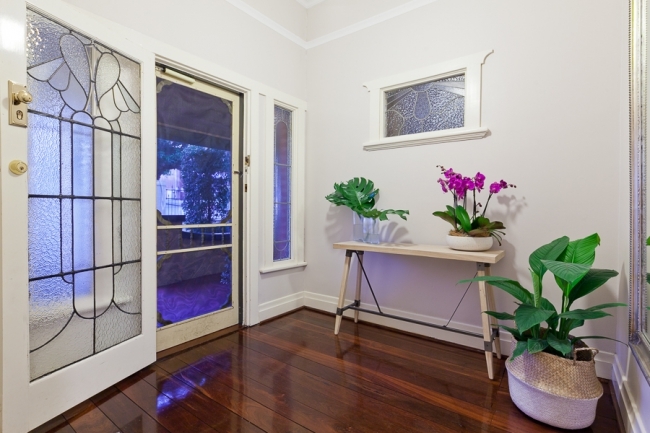 Change your front door – make a statement with a pop of colour or a brand new simple design. Update light fittings. 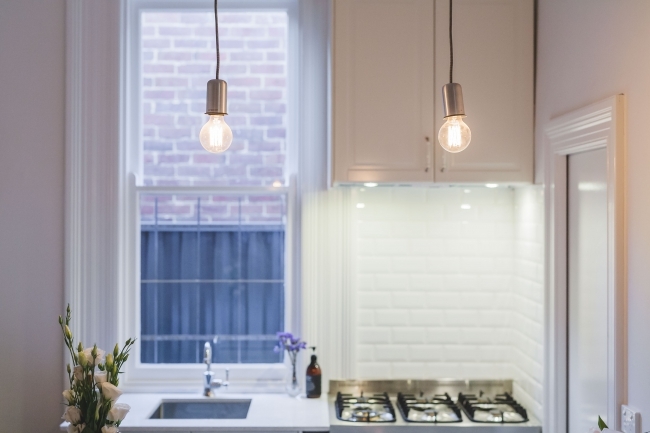 Big W, Target, Kmart and IKEA have cost-effective lights that are easy to install and make a big impact. Mulch and weed your garden. It sounds simple but a clean outdoor space that’s warm and inviting is just as important as a clean indoor space. Clean your floors and your windows. This includes carpets, tiles and grout (or regrout if needed). Declutter, add a lick of fresh paint (if required) and fix any obvious structural issues. Cast your eyes over the space and ask yourself, “What can I do to quickly tidy it up?” It takes less than a few minutes per room and cleanliness is key. Use a window wiper to clean your shower after each use so the glass is streak-free and ready for any last minute inspections. 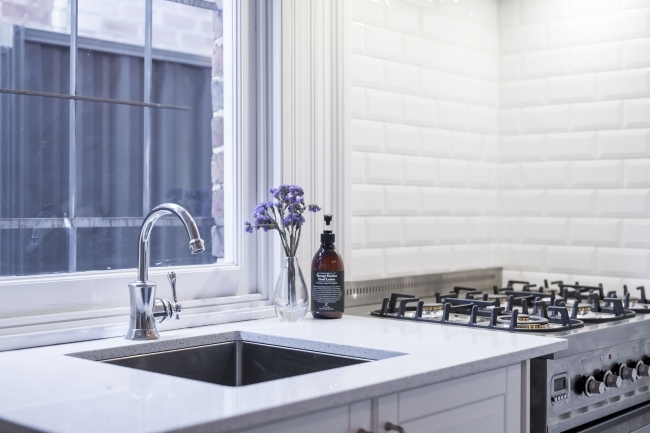 Vinegar is also a great home-made cleaner – but be careful not to overuse because your home can go from squeaky clean to fish and chip shop in an instant! Put the dishwasher on, clean the floors, wipe your benches and take the rubbish out so people can’t smell what you ate for dinner last night! Thanks to Nadija and The Perth Property Co team for supporting this story. You can check out their website here or follow them on Instagram @theperthpropertyco, Facebook or Houzz for inspiring before and afters and property styling and staging advice. Real estate photos used of Nadija’s listings (past and present). Thank you Maya! My parents are thinking of selling their home in Mt Hawthorn later in the year or early next..... but some serious culling and styling is what it needs and I'm not game enough to do it!! I am going to tell them about this!! God poor Nadia cleaning up that horrible tenant's mess and fridge! Some people are just disgusting! Good on Nadia though. Nice to see a real estate agent whose willing to do the hard yards and it shows it pays off. I'm always surprised that more real estate agents don't offer this staging as a service, or even just as an add on that you pay for. I agree. When I read about Nadija going home to get her own vacuum cleaner I thought that I would not want MY vacuum cleaner to get into contact with such horrible mess (it sounded like an episode from Hoarders). I thought that Nadija should have purchased a vacuum cleaner and tack the expense on top of her commission. She deserved to be paid for taking care of such disgusting mess! Great article, very true too. Im surprised more agents having started doing this, its a great idea. Some houses you see for sale (especially rentals) are disgusting, it doesnt take much effort to have a tidy up. I love property, buying/selling, renovating, I'd love to get a job for someone like that. I also was disgusted when we were house hunting a few years back! What an awesome idea, and just goes to show sometimes you have to take an idea and just run with it. Love the tips, will definitely be bookmarking this and coming back to it when it sis time to sell our unit. I often think if people living in big cities are more open to staging than people in smaller towns. Sometimes, when I look online on listings from where I live, I see walpapers that were in style 30 years ago (or wallpaper boarders), etc. Clearly those people believe their house is perfect as is and nothing needs to be changed so I wonder if they would be willing to shell out money for staging (here [read: in Canada], it's typically taken care of by professional stagers, I have never heard of any realtors who would do it for free (but it doesn't mean they don't exist). It is common for realtors to give sellers tips how to improve the appearance of their house (outside + inside). A while ago, there were two shows on HGTV that I loved: "Buy Me" (about people selling their houses; there was no professioal staging but it showed what the realtors suggested be done and the home owners doing the work themselves) and Stagers (which, I believe, featured real-life stagers from a staging company in Vancouver). On the Stagers show, the prices for staging were quite steep (several thousand dollars) although Vancouver has always been a hot market where real estate sells for a lot more than anywhere else in Canada. Both shows were very interesting (if you are a house nerd LOL) and I wished both had more more seasons.